Food and drink are as essential at a wedding reception as the presence of the bride and groom! Hit the right note with your guests and make all the right choices. 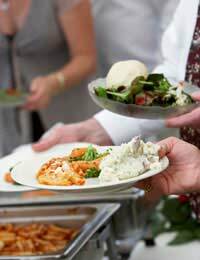 What you serve and how you serve the food at your wedding can massively affect the total wedding bill. Holding a wedding at home and intending to make it an intimate affair? You may be able to get away with a simple buffet. Holding the reception at a grand venue complete with head chef and serving staff? Flex that credit card limit! There is no right way to wedding receptions but think about what you can afford both financially and in terms of time. For most of us, the stress of organising a dinner, ensuring that it is served correctly and that everyone’s dietary requirements are satisfied is simply too much stress to shoulder. Even if you are holding an at-home reception, brining in a local catering company will dramatically lower those big day stress levels and it’s an option that you should strive to incorporate into your budget as much as possible! The Formal Meal – this comes with the most traditional and most expensive tag! Here all guests are seated at allocated spaces and served a selection of wines, a three-course meal and coffee. Choose this option only if your pockets are lined with gold. 100 guests at £40-£60 a head makes an impressive sum! The Buffet – A classic buffet reduces costs considerably. The food can be just as tasty and as extravagant as that served during a formal sit-down meal, but here there is no need for silver cutlery or as many hired serving staff. Remember though that the required space at the venue will still be the same. No one will be impressed at having to stand and eat – tables and chairs, complete with fine linen and centerpieces are still a must. The Alternatives – if you are blessed with good weather and live in a climate which guarantees a clear day, opt for something a little more alternative. Picnics on the beach or on a lawn are a contemporary way of feeding your guests and will go far to evoke a fraternal and friendly atmosphere. Whichever type of meal you serve, there is probably one thing on your mind. Even if you are cutting corners you don’t want to appear “cheap”. This is a minefield and many a fiancé has battled through it. Serve beef and everyone will be happy. Serve chicken and some of your more picky relatives may turn their noses. Fish is fine but serving a “fish medley” sounds distinctively like a budget option. Adopt a policy of sanity here. Most of your guests will not care how much you spent – for them, the day itself is more important. Keep that in perspective and you will be fine! Christian weddings involve lots of toasts to the happy couple and general merriment. It’s your wedding and to some extent you are responsible for ensuring that there is enough to go round. How much do you spend at the bar? Well, factor in the following. Its normal to give your guests a drink at the reception – in fact champagne is often the tipple of choice. At the meal itself each table should get a white and a red wine option, and both options should be replenished at regular intervals to ensure that supplies are not running low! The speeches will involve several toasts and a full champagne glass is the standard. After this point it is quite common to open a pay bar. You might want to put some credit behind the bar but this really depends on your overall budget. There is no shame in making your guests buy at least one of their drinks! The cake is more than just flour and water. It is a focal point for the day and an important reflection on the type of wedding that you are holding. If you are having a traditional wedding then you must have a fruit cake with thick white icing and it simply must be tiered. However, there are plenty of alternatives. Cherry chocolate fillings, carrot cakes or even a cake composed entirely of individual cupcakes are all viable options. The best advice? Choose a flavour and type of cake that both you and your fiancé like. If you are getting it done professionally make sure you go to the tasting – you want to be absolutely satisfied that you are making the right choice. If you are making it yourself, bake it at least three times before the big day. There is no such thing as too much preparation! Catering is a big deal for any large event. At weddings the pressure heightens and the costs double. Keep this in mind and go for the option that you feel most comfortable with. Don’t be afraid of bucking tradition – this day is all about you!